Why not combine Christmas shopping with a caravanning mini-break to ease yourself into the festive spirit? Shop for unique gifts in the city markets, treat yourself to a hot toddy or sugary strudel and sample the festive fayre by a log fire at local inns around Chew Valley. 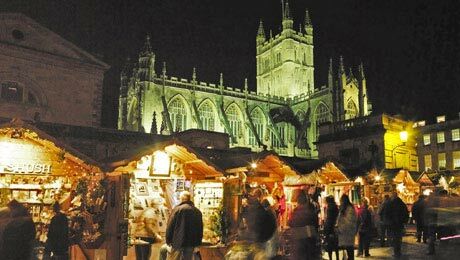 Held in the beautiful square between Bath Abbey and the Roman Baths, this premier Christmas Market is adorned with up to 165 wooden chalets offering handmade gifts, decorations and seasonal foods. We have a 3 night minimum for weekends through the Bath Christmas Market season and pitches are booked very quickly, so please book early to avoid disappointment. Bristol opens its Christmas season with a spectacular circus themed 'lighting-up' event in Cabot Square, 7 November from 4.30 - 6pm. 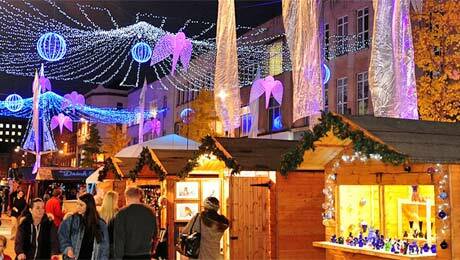 You can experience wonderfully traditional Christmas markets around Bristol all the way up to Christmas Eve. It's easy to travel into Bristol City centre, either to the Park and Ride or on local buses from Bishop Sutton village. Bristol's city centre Broadmead Market features 55 cabins offering gifts and deliciously festive food and drink every day until late. Bristol's local Christmas Market features the very best in Bristol produce. You'll find its 20 chalets along Broadmead West between the Podium and Union Street. It's a treasure trove of artesian crafts, select gifts and local foods. Bristol's Harbourside is always worth a visit, and especially Saturdays and Sundays between 24 November and 23 December when the Harbourside Christmas Market is on. Local traders will be featuring jewellery, crafts, local foods in a festive atmosphere with live music. 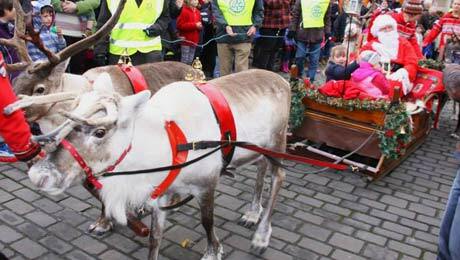 Yes, REAL reindeer hauling Santa Claus through Wells' market place and city centre. It's a wonderful local Christmas festival. Wells' Christmas Fayre is a delightful market set in the city's market place and along the Bishop's Palace Moat. Wells is just the place to ease into Christmas week in beautiful surroundings and there is free car parking for the fayre. Looking for a caravan pitch over the Christmas holiday? Find more about Christmas at Bath Chew Valley or Christmas Holidays in Chew Valley Lodge.